Seller (Rating) clairon (49) "*"
Options Seller:Didn't sell your item the first time? eBay will refund your relisting fee if it sells the second time around. ïRelist this itemand eBay will refund your relisting fee if it sells the second time around. Seller assumes all responsibility for listing this item. You should contact the seller to resolve any questions before bidding. Auction currency is U.S. dollars($) unless otherwise noted. No Reserve Micron Xceed GrayScale Adapter (clone) for SE/30 256 SHADES OF GRAY ON THE SE/30 INTERNAL DISPLAY! Plug and Play ~ No software required! !! !ÝRequires either Xceed Color 30, Color 30HR, or MacroColor 30 PDS slot video cardÝ!!! It might be compatible with the Xceed MacroColor 30HR card. Provides 4, 16, or 256 shades of gray on the SE/30 internal display. 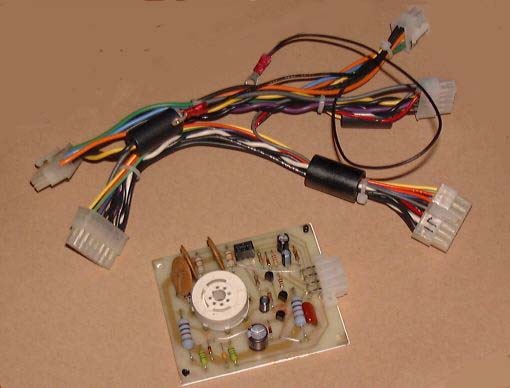 This is a replica of the Micron Technology 'Xceed Gray-Scale 30' adapter for the SE/30. (1)...video printed circuit card, which replaces the Apple video card on the back of the CRT. (3)...original Installation Guide (not a copy). (4)...MonitorXCEED control panel software (not required). Click this link to see 5 screenshots taken with this adapter in my SE/30. Guaranteed working, thoroughly tested with Systems 6.0.8, 7.1, and 7.5.3 with Xceed Color 30 card in SE/30. There are very rare SE/30's with incompatible CRT base pin configuration. Click on this link to see the required configuration. Buyer to prepay in U.S. funds with PayPal, BidPay, postal money order, or personal check (shipping delayed until personal check clears). We do not accept BillPoint. If payment is not received within 7 days after close, then auction goes to next bidder. Buyer pays actual shipping costs from ZIP 94024. Free packaging. Shipping only by United States Postal Service, any USPS method desired by buyer. Brought to you byÝ: All graphics courtesy of Igor at Vancouver field office.